Joseph Hodge will conduct the Manchester Symphony Orchestra on Saturday at Manchester High School. MANCHESTER — On Saturday, April 21, the Manchester Symphony Orchestra, conducted by Joseph Hodge, will perform works that highlight different sections of the orchestra — brass, percussion, winds, strings — as well as the entire realm of orchestral colors. The concert program begins with “Fanfare for the Common Man,” a brilliant showpiece for brass and percussion by Aaron Copland. Copland used a stately tempo and open chords to create a feeling of spaciousness in the music, like that of the vast American continent. The next selection on the program features the wind section. After hearing Mozart’s “Wind Serenade,” Czech composer Antonin Dvorak was inspired to write one of his own. He originally wrote it for the small wind ensemble typical of Mozart’s era, and later added additional parts for stringed instruments. J. S. Bach’s “Double Concerto” is one of classical music’s iconic works for strings. Bach’s mastery of Baroque musical techniques creates an intimate musical dialogue between the two violin soloists and with the entire ensemble. This concert’s two violin soloists, Hannah Adler and Natalie Wong, are students of the Suzuki Program at the University of Hartford’s Hartt School of Music Community Division. Adler and Wong will join the Manchester Symphony Orchestra and Chorale’s many Hartt students and alumni. 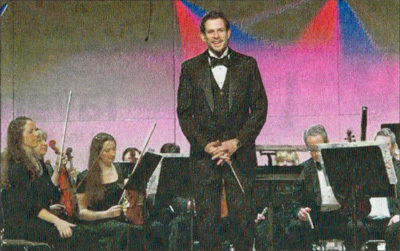 MSOC’s current roster includes more than two dozen of them, including orchestra director Hodge. Pete Bradley, a former Manchester Symphony president, is a violist in the orchestra and an enthusiastic supporter of Manchester Symphony’s activities to engage area music students. “This event is not only a learning experience for the performers, but also students who will see how they could be onstage as soloists or in the orchestra someday,” he says. Nothing less than a full orchestra could convey the drama of Berlioz’s “Symphonie fantastique,” the musical depiction of a romance descending into despair and jealousy. The orchestra will perform one movement, “the March to the Scaffold,” a young man’s terrifying vision of his own execution. Nikolai Rimsky-Korsakov was not only one of Russia’s most famous composers, but also a naval officer and inspector of the Russian Naval Bands. His practical knowledge of woodwind and brass instruments can be heard in his brilliant orchestrations. Rimsky-Korsakov scored “Capriccio Espagnol” for a full orchestra, adding interest by repeating the same music, but with different groups of instruments. He evoked the music of Spain with castanets and a tambourine in the percussion section, and writing for the strings that emulates guitars. The concert takes place at 7:30 p.m. on Saturday at Manchester High School’s Bailey Auditorium at 134 Middle Turnpike East. Tickets can be purchased at the door. Prices are $18; $15 for seniors; $10 for students, and free for those younger than 18.